New Years Eve is just around the corner and I'm very excited to be welcoming in 2017 with friends and maybe a glass of prosecco or two! I really enjoyed putting together my last post on Christmas day make up and as soon as Christmas was over my thoughts started wondering to what make up look I would go for on New Years Eve so I've decided to share that all with you too. For a night out I love to go all out with my make up so of course for NYE I need to step it up another notch! I want a super long wearing, tried and tested base so I don't have to worry about touching up my make up all eve. I'll start out with the Nyx Angel Veil Primer before going in with the Kat Von D Lock It Liquid Foundation, this stuff is super full coverage and long wearing. I'll then apply some Mac Pro Longwear concealer as it covers up a multitude of sins and I have to admit after all the bad eating over Christmas my skin isn't looking its best so this will be a life saver. Just to make sure this concealer isn't going anywhere I'll fix it with the Nyx HD Loose Powder. I'll crack out the Anastasia Beverly Hills Cream Contour Kit in Fair as I don't opt for cream contours much day to day so it'll feel like a treat. Of course I'll be using my trusty Sleek Solstice Palette for an intense highlight, I apply this on my brow bones, cheek bones and cupid's bow. I'm then going to spray on a whole load of Mac Fix Plus as it gives such a lovely finish to the skin and takes away any cake face you might have going on. I love creating a brown smokey eye for nights out so the Too Faced Chocolate Bar Palette will be where its at. I'm keen to create a cut crease too so once I've added shadow to define my crease I will go back in with the Mac Painterly Paint Pot to really carve it out, then add Mac Tan Pigment on top. I only got Tan pigment yesterday and am absolutely dying to try it, I tend to save pigments for special occasions as they are a little messy so more time and care is required. For brows it has to be Anastasia Beverly Hills Dip Brow Pomade. 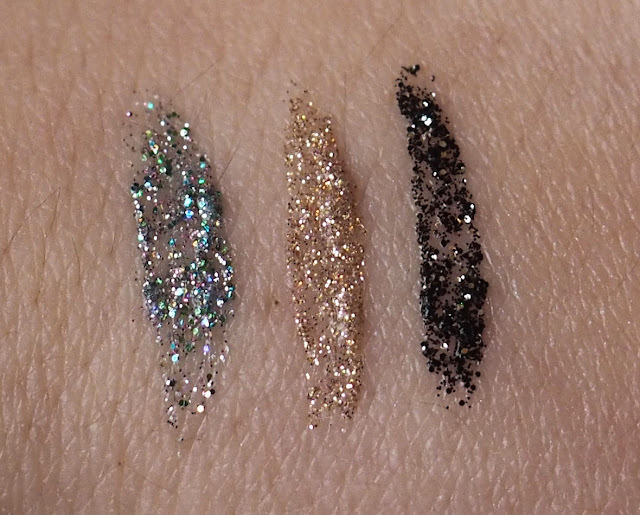 I've just picked up three of the Collection Glam Crystals Dazzling Gel Liners as I wanted to add a little extra sparkle to my eye make up. I have the choice between Hustle which is a multicoloured but mainly silver glitter, Funk which is a gold glitter and Rock Chick which is a silver glitter in black gel. Testing these out they seem really packed full of glitter and opaque so I have high hopes- I'll keep you posted! Finally for the eyes I will of course stick on some falsies, I've just got hold of the Eylure Fully Fleur lashes by Fleur De Force which I can't wait to use as they're all criss-crossed and fluttery, just how I like my lashes. You do get a little glue with them which I'll pop in my handbag for emergencies but the one I will stick these down with is my trusty Duo Lash Glue (the one with the brush, not the horrible squeezy tube!) as it never fails me. I'm all over vampy lips so I'll be using Mac Nightmoth Lipliner which is a deep, intense red and then a deep red lippie such as Mac D For Danger. I have used this combo loads recently on nights out and am obsessed with it, the lipstick is a little lighter than the liner so you can create the nicest depth to your lips. 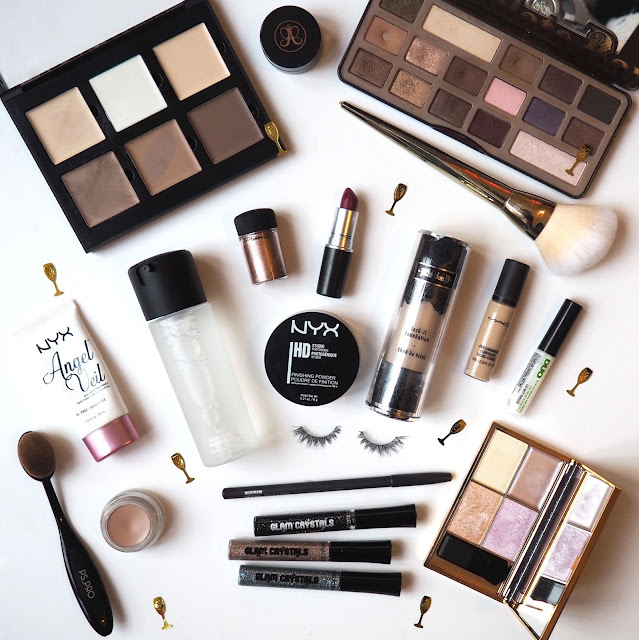 Hopefully this has given you a few ideas for your NYE make up, I honestly can't wait to apply all this, haha! Whatever you are doing to celebrate my lovelies have an awesome time!